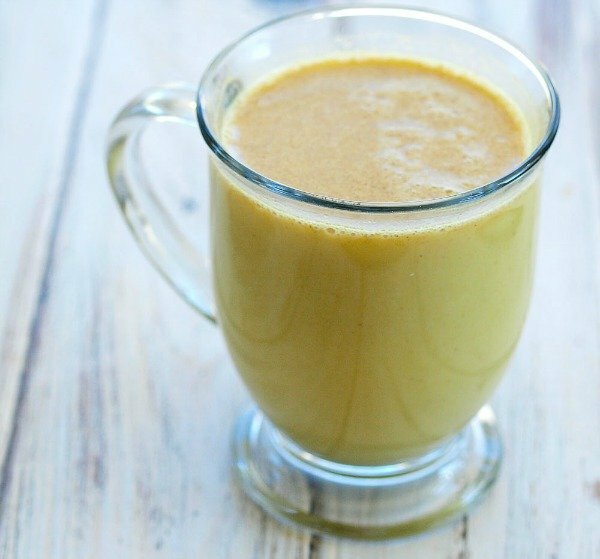 Golden Milk Turmeric Tea, made with turmeric, is a powerful anti-inflammatory drink that may ease depression symptoms, build heart health, relieve arthritis symptoms, and more! I love the way blogging connects me to so many people everywhere. Last year, when I blogged about the finger pain I was experiencing, My Great Aunt Janey sent me an email telling me about a Golden Milk recipe. I see my Great Aunt Janey once every few years, so there’s no way she would have known about my finger pain without this blog. Now I know my Great Uncle Carl (who I’ve always looked up to for his healthful ways) drinks Golden Milk as a way to fight inflammation and naturally soothe arthritis pain. The power of the blog. I’ve since started using turmeric in my cooking more, like in this recipe for Cauliflower Soup with Turmeric. Now it’s time for me to pass on what I learned from my Great Aunt Janey. 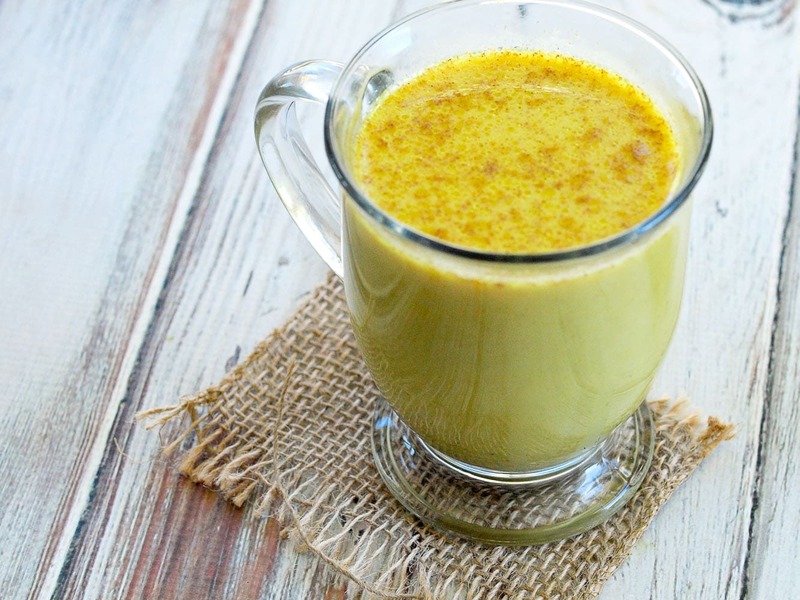 Golden Milk, also sometimes called Turmeric Tea, is a warm beverage filled with health benefits. The star of the show is turmeric. Turmeric is known for its anti-inflammatory effects (source). Inflammation is linked to numerous health conditions and diseases, so everyone should be diligent to keep it at bay in their bodies. Turmeric also has antioxidant, anticarcinogenic, and antimutagenic properties. (source) This superstar may also ease symptoms of depression naturally, relieve arthritis pain, and build your heart health (source). With all those health benefits, you would be crazy not to give this a try! 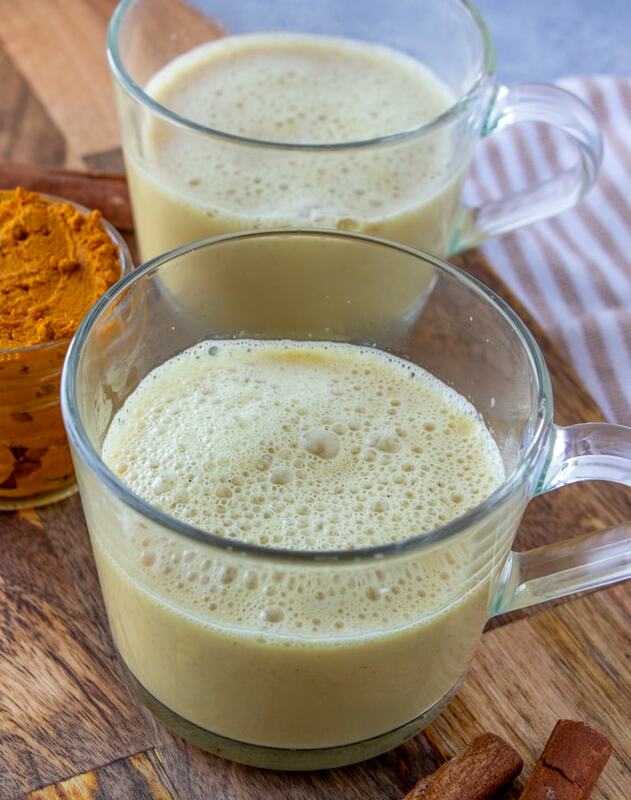 I find I crave a warm drink in the afternoon, so Golden Milk has been a perfect healthful beverage to satisfy that craving while delivering powerful health benefits. How do you make Turmeric Tea? To make Golden Milk Turmeric Tea, first you need to have turmeric paste on hand. This takes five minutes to make and then you can have it on hand in the refrigerator. It will last about two weeks refrigerated. Turmeric powder is mixed with water and black pepper to make a paste. The black pepper is important as it increased the absorption of the turmeric. It won’t do us any good if our bodies can’t absorb it, right? I also add coconut oil to my Golden Milk because the fat also helps with absorption. It also adds another set of health benefits, which you can read about here. Ideally, drink Golden Milk Turmeric Tea everyday. I hope you’ll add this turmeric tea recipe to your daily routine. I would also love it if you’d share it with someone in your life who might need it. Here’s to our health! 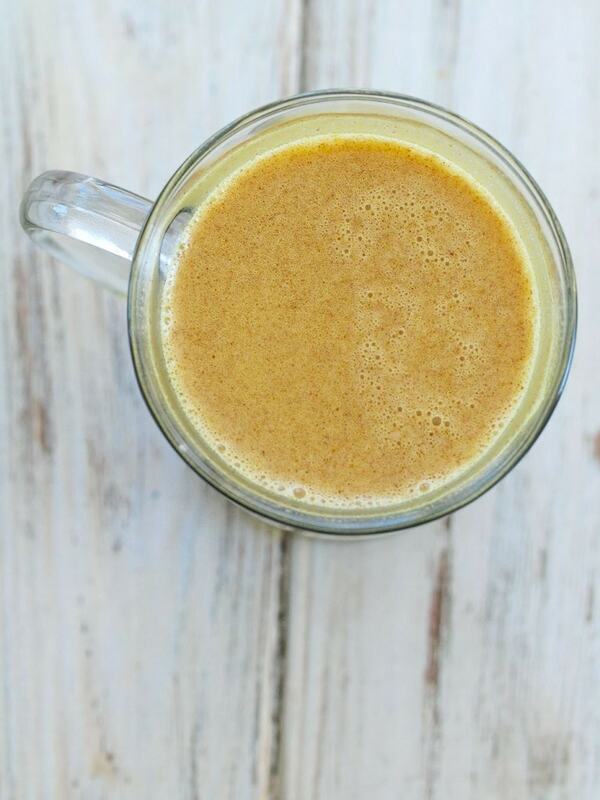 This Golden Milk Turmeric Tea is a great anti-inflammatory drink! Mix all ingredients in a small saucepan and gently heat over low heat. Whisk well to ensure you combine the paste, oil, and spices. Mix the turmeric and water in a pan over low heat, stirring until a paste is formed. Once you have a paste, stir in the black pepper. Cool and store in a glass jar in the fridge for up to 2 weeks. 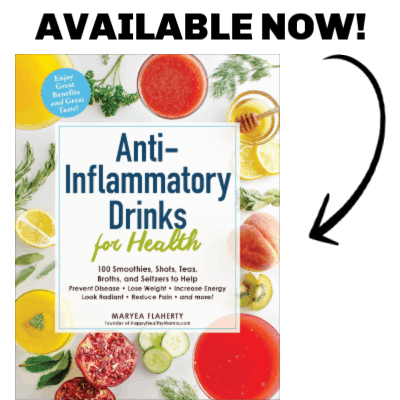 This recipe is included in my new book, Anti-Inflammatory Drinks for Health, which will be released February 12th! Click below to preorder your copy! This post was originally published in 2015. Some photos were updated an a video added January 2019. I make Golden Milk with turmeric powder and without black pepper. Is your milk spicy? Coconut milk has a lot of fat that helps the absorption of turmeric, but I guess one can never have enough healthy fats, right :)? No, not spicy at all. Maybe a tiny bite from the pepper, but not really noticeable. I’ve read that the pepper increases the absorption the most, so that’s why I include it. Thank you, Maryea. I will play a bit with the amount of black pepper until I get a good ratio. I don’t like foods or drinks too spicy, but a bit of heat it’s okay. If you don’t like the pepper, add a little coconut oil. That will also allow you to absorb the good properties of the turmeric. You need the black pepper to create the anti-inflammatory properties combined with turmeric! Such great info here! I’m currently not experiencing any pain but I still want to try this out and share it with others, thanks! I believe so, but it’s always best to double check with your doctor. Yes, it is safe. I have hbp and meds. I’ve been following your blog for over a year but this is my first post. Thank you for all of the recipes, perspectives, and ideas you put forth in this blog. Our family has benefited from your willingness to share your family’s journey. This tea is great and very timely. 🙂 I just wanted to add that to save time first thing in the morning (I am experimenting with subbing this for my morning coffee), I combined all of the ingredients (except the turmeric paste and almond milk) together in a small canning jar. I warmed the raw honey and coconut oil first to often it so it blended well with the other ingredients. Now in the morning, I heat up my almond milk up and drop in a tablespoon of the other ingredients and 1/2 teaspoon of turmeric paste whisk well and I am set to go. Anything that saves an extra step at 6 am is good news to me. Hi, just to give you some insight on Turmeric Milk. This has been found in Ayurvedic Medicine, which is a branch of medicine founded in India, more than 5-10 thousand years ago. In Ayurvedic Medicine, it is recommended that one should drink this milk for medicinal purpose only, not as a snack. Since Turmeric is anti-inflammatory, anti-fungal, anti-viral also used in Indian cooking you can have Turmeric as part of your daily food intake, other than milk. Do you know why? If I’m not getting it in my daily diet, wouldn’t it be beneficial to drink this daily? Can you make up the drink and refrigerate for later ? Can you ginger paste in the tube or does it have to be ground ginger ? Just asking because I thought I had all the ingredients ,but left out ground ginger. You can use fresh ginger also. Use about 1/2 teaspoon minced. Thanks for this! Exactly what I was thinking I’d do too, makes it so much easier and I’m more likely to make it when I’m pressed for time. I like the idea of having all but the honey and milk of choice pretty mixed as it would make my putting it all together much faster as well. I just need to measure it all out. Also I was pleasantly surprised when nature slave says mentione the instant honeyed ginger drink as I have this every morning instead of coffee. I will be trying this together tomorrow. I wanted to ask how often the golden milk can be drank in a day? Thank you for sharing this recipe and I looklook forward to reading more of you blog. I’m a little late to this party, but is there a reason you couldn’t mix all of the ingredients except for the milk and store it? Sorry I missed your comment on this! I can’t think of a reason why you couldn’t do that. That’s actually a really good idea. I’m going to give it a try and I’ll let you know how it goes. This is an amazing drink. If anyone knows, it may be me but, is there a reason why heart rate rises when drinking this? Has anyone noticed/felt the same way? I have not noticed that at all. Interesting. Sorry I can’t give you any insight. I’ve been experiencing arthritis in my hands and this seems to be very promising. I will attempt to make this, but I was wondering how soon after did the arthritis/pain subside? I think that will vary person to person. For me it’s been in conjunction with other diet changes (eating less sugar, less gluten, and more anti-inflammatory foods) that I noticed a difference and I noticed it within a week. If you’re only drinking this, however, you might not notice it as quickly or as drastically. This is true, if you are experiencing arthritis, RA, or joint pain then getting of glutens, sugar and dairy from your diet is really going to make the difference and this drink is the icing on the cake. Try that for a week and see how you feel, what have you got to lose? Can you make the paste with fresh Turmeric instead of powder foam? That’s a great question! I”m sorry but I’m not sure since I haven’t tried it. Truthfully what does this taste like? Bitter, sweet, bittersweet? I am very much a sissy when it comes to taste and/or texture..don’t want to spend the $$ for the ingredients just to try this once and end up be grossed out. It’s sweet with a little bit of a bite from the spices. I think it’s delicious! My husband compared it to a Chia latte. I was also afraid to try this since I’m quite closed to trying new foods, and have never experimented with herbs and spices. I’m happy to say that this is my favorite hot drink ever!!! It tastes a lot like pumpkin pie or chai latte. I started by buying a chai tea keurig box. I loved it so much that I just graduated to trying the golden milk. Very yummy and not too spicy. Hope this helps! Just now made and it’s delicious, and to me, its not spicy at all. I do suffer from arthritis & joint pain was just wondering how often should you drink it? I’m also going to turn my on to this b/c she has RA and I hope this will her deal with the pain. Thank you much for posting your recipe. I would drink it everyday if you can! Ive been wanting to try this and I finally did for the first time tonight. It was delish. I think i will add more cinnamon and vanilla next time. I have the paste in the refrigerator, and I think I will take it to work with me tomorrow to share with my friends. Thanks so much. This was just lovely. Thank you so much for sharing! Tks for recipe. So, do i make paste first then add other ingredients? Yes you can put little dollops of the paste on a parchment lined cookie sheet and freeze then pour the frozen bits in a container in the freezer. Take one or two daily. Fantastic health benefits even for our pets!! Google it. you can also make little turmeric “bites” by mixing turmeric, black pepper, and honey or coconut oil and baking them. i also had a question about this recipe though. somebody else asked but i think it got overlooked in the comment stream. is there a reason you can’t mix the spices, oil, and honey into the paste and keep that in the fridge? That’s a good question. I can’t think of why you couldn’t. I guess I hadn’t thought of that. I’ll have to try it! When I do, I’ll let you know how it goes. It’s nothing but “Instant Golden Milk Mixture”, its certified Organic, packed in small sachets for your convenience, can be mixed with Cold milk as well as hot milk. We are presenting 2000 years old India’s wisdom on Turmeric to the world. We hope this would be in your daily diet. Please fill in the survey form to improve our product and serve you better. Our “Turmeric Love” will be available all over U.S grocery (Initially through Amazon). Wow sounds fantastic. Thanks for sharing. Will be glad if you attend our survey and we would love to share you a sample pack mixed flavors once we launch our range in Amazon. It’s thick enough that it holds together (it’s not totally liquid-y) but loose enough that you can stir it. Does that help? Am wanting to try this. I can not find the recipe for the turmeric paste anywhere on the post. Can you give the recipe again? Thanks! 1/2 cup water, 1/4 cup turmeric, 3/4 tsp black pepper. Can you go ahead and mix the cinamon and ginger into the paste too or any of the other ingredients? Thumbs Up! I’ve gave it a try & had to share it with my step son. He wanted more so tomorrow nite I’m making doubles. The flavors are well combined and it was great. Thanks for the recipe. 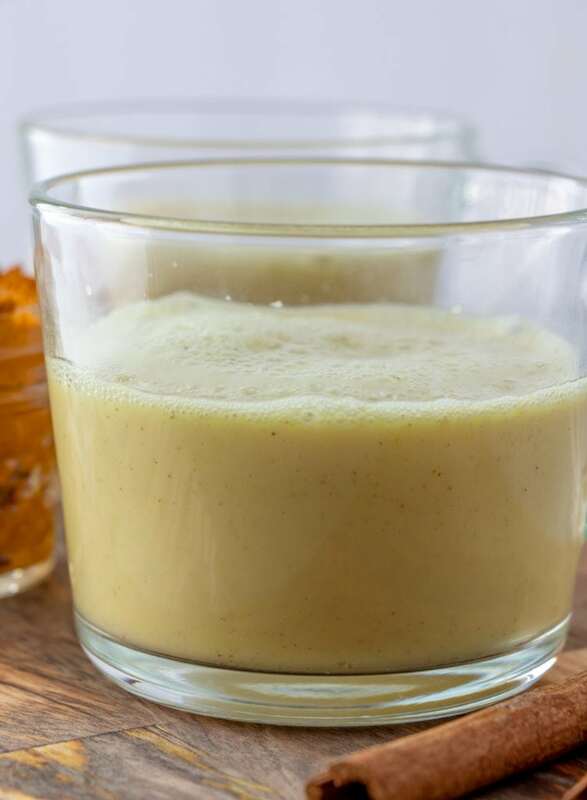 I love to make an almond milk frozen fruit smoothie with turmeric. Not warm, but still delicious! Oooh thanks I’m going to try that! Thank you so much for this recipe! 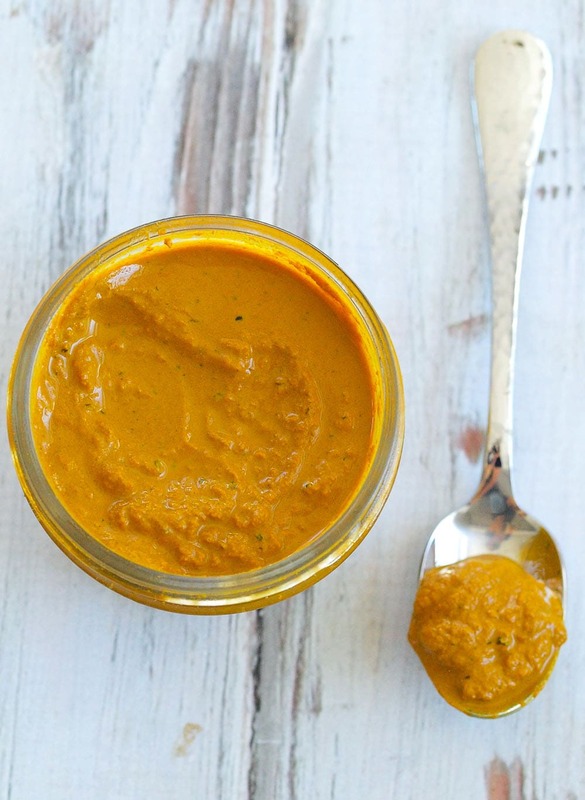 I have been looking for ways to get more turmeric into my diet! I am allergic to coconut. What fat would you substitute. You could use ghee or even extra virgin olive oil if the taste wouldn’t bother you. I have made this many times and I love it, however the turmeric paste recipe is no longer showing up on this site. Any suggestions? Please check back and see as it’s showing up for me. I was having some website problems last week so that may have been the problem. It’s together with the regular recipe, right under the last ingredient of the tea. Thanks! I just made the paste for the first time adding nutmeg and cinnamon and pepper. I then heated a teaspoon of paste with coconut/almond milk, put in a packet of ginger Honey tea granules (found in Chinatown grocery stores) a dollop of coconut oil and a bit of cinnamon. It was amazing! Worth trying for the inflammation! I can’t thank you enough. This is absolutely delicious. I swear I cured a nasty dose of flu in a couple of days because of this! Yay! So glad to hear that, Andrea! The paste recipe is within the recipe. It can be hard to see at first glance because my recipe plugin does not allow me to separate two recipes within a recipe card. Yes, you can. It’s generally thought that cow’s milk is inflammatory, which is why I recommend not using it, but you certainly can make this with it. Can you tell me why i cant drink daily at night? Can I use fresh turmeric instead the powder one to make the paste ? Love this drink. I often like to drink something hot before bedtime but am limited because of the caffeine in most hot beverages I like. This will easily become my evening beverage. It reminds me of chai tea. Maybe i missed it but what do you think about mixing this with hot tea. I drink a calming tea every evening and was thinking it might be good in that as i really dont like milk. I want to try your recipe. What type of tumeric powder do you buy? Can I buy in a regular grocery store? Yep–it’s in the spices section of your grocery store! I’m glad you like the taste, Sharon! I would love it if you’d report back whether you notice a difference if you drink this consistently. I hope it helps your RA! Hi there. I just made the turmeric paste for the first time and my mixture is very soupy. It doesn’t look like a paste at all. Will this thicken in the fridge? It thickens as you heat and stir it. Maybe you didn’t do that long enough? Mine is a paste before I put it in the fridge. I just made this paste and then the smoothie with the paste on it and it’s DELICIOUS!! I suffer from psoriatic arthritis and two other autoimmune inflammatory diseases and I’m trying to be as holistic as I can. I do take infusions monthly which I hate but if it helps me to live a quality life, I’ll do what I just. That doesn’t mean I can’t be in charge of what I put into my body. THIS recipe and the smoothie with the pineapple and mangoes are my complete favorites?? Thank you so very much for your blog and your hard work and knowledge and really just for being thinking of you?. I just made this paste and then the smoothie with the paste on it and it’s DELICIOUS!! I suffer from psoriatic arthritis and two other autoimmune inflammatory diseases and I’m trying to be as holistic as I can. I do take infusions monthly which I hate but if it helps me to live a quality life, I’ll do what I just. That doesn’t mean I can’t be in charge of what I put into my body. THIS recipe and the smoothie with the pineapple and mangoes are my complete favorites?? Thank you so very much for your blog and your hard work and knowledge and really just for being thinking of you?. I’m so appreciative and blessed. Stupid autocorrect ? I’m trying to say thank you for being you but every time I type it , the words “thinking of you ” slip on. Lol. Thank you so much, Faith. I appreciate your kind words more than you know. Thank You for sharing such a magical drink recipe. Its color is so nice, healthiest & tasty drink. The recipe of golden milk is very easy & ready in short time. I liked It so much!!! I wanted to try this months ago,but wasn’t sure if i;m going to like it..and well..I just made it and I LOVE IT! thank you!! Hi! This rdcipes is great!! I use the carton kind for this, but canned will work also! Why do you have to make paste? Couldn’the you just add all dry ingredients with powdered coconut milk & drink? Is it ok to use regular dairy milk for this recipe? Would it affect the taste negatively? It would not affect the taste in a bad way, however, cow’s milk is considered inflammatory, so I don’t recommend it if you’re trying to fight inflammation. Can ginger essential oil be used and if so, how much would I use? It can, and I’d use just one drop. Someone made golden milk for me once, and I was apprehensive but ended up loving it. I’ll have to give your recipe a try! Thanks for sharing! I hope you love this one!! Does this recipe make one or two servings? I made it for the first time tonight. I love it! Hope out helps my inflammation and RA. Can I heat the golden milk using my microwave instead of getting a pot dirty? How many servings will this paste make? I want to combine most of all of the ingredients together but not sure of amounts to use and I couldn’t find how many servings the tumeric paste makes. Thanks for this…I have RA and have been wanting to try this! I love this recipe. I made some extra so I could use it to make overnight oats for breakfast. 1/2 cup rolled oats with 1/2 cup turmeric tea. Combine and put in the refrigerator. Enjoy a wonderfully healthy breakfast in the morning. My co-workers thought it looked disgusting but it tasted delicious. I have also been making oatmeal with the tea recipe and adding maple syrup. Yum!! I have hormonal acne.. can this drink help me with this problem ? Please check with your doctor to be sure. Will it be ok to use flax seed oil along with the Turmeric to make a warm tea /milk drink for the morning. Right now I never added any oil will this mixture will that pose a problem I used raw honey and turmeric for my first mix. I just meed tyo know what to expext. I’m afraid the flax seed oil will have to strong of a taste. If that doesn’t bother you, then it will be okay. This recipe makes 2 servings, could I drink both during the one day? It was delicious by the way, I will wait and see how it helps my joints. Thanks for sharing ? Hi , I have a question. Im pregnant and have MS , do you think its safe to drink this? I’m not aware of any reason why this wouldn’t be safe for you to drink, but it’s always best to check with a medical professional. I drink this before bed. Before I started drinking it, I had trouble falling asleep and staying asleep. Now I sleep like a baby! And it does taste delicious! HI. Did I read something wrong? I did not get a paste with the turmeric and water. 1/4 cup tumeric and 1/2 c water just came out very watery! I made a turmeric tea/ golden milk before and wasn’t too fond of it. I just tried this recipe and LOVE it! Thanks for sharing!! I will pass this on to others. This is my first time making the recipe and I really enjoyed it. Do you think it’s necessary to strain before serving? I did have a bit of the turmeric mixture at the bottom of my cup even though I whisked it constantly while heating. I have also seen other recipes where it says to strain it before drinking but then I worry you would lose some of the turmeric.